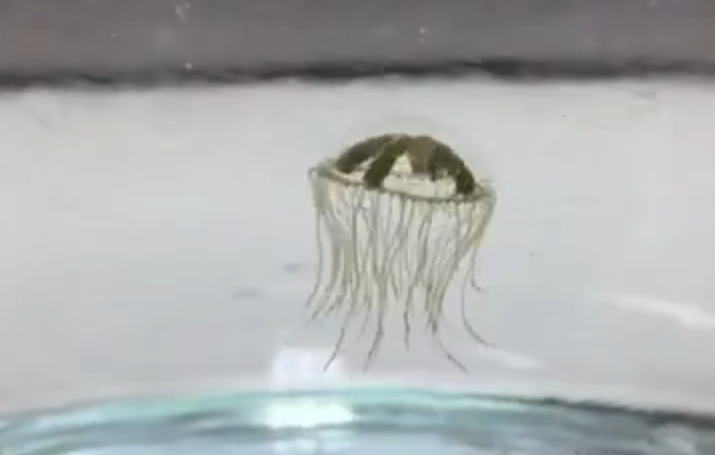 The clinging jellyfish, a quarter-size species that packs a powerful sting, has returned to New Jersey waters, and scientists are scouring local waterways to see if it is present in Ocean County. No clinging jellyfish have been found in Barnegat Bay or any of Ocean County’s rivers, the state Department of Environmental Protection said, however a total of 17 small adults were identified from the Shrewsbury River in Monmouth County during a sampling that took place Friday, June 2. Montclair State University is resuming the second phase of a DEP-funded study of clinging jellyfish, a small, invasive jellyfish that packs a powerful sting, which was first spotted in New Jersey waters last year. It was originally found in the Manasquan River (and there were anecdotal reports about it being found in northern Barnegat Bay) but it was discovered to be most prevalent in the waters of northern Monmouth County. The clinging jellyfish is not known to inhabit ocean beaches or other sandy areas, but tends to attach itself to submerged aquatic vegetation and algae in back bays and estuaries – areas not heavily used for swimming, the DEP said in a statement issued Tuesday. The jellyfish is an invasive species from the Pacific, and its presence in Atlantic waters is not fully mapped. Multiple stings from the clinging jellyfish can cause “acute respiratory problems, joint pains, and acute dermatitis that can take days to heal,” according to a report from the Woods Hole Oceanographic Institute. Bologna, working with Dr. John Gaynor, Professor of Biology at Montclair State, will use DNA analysis of the 17 individuals collected last week to also detect early developmental forms of the clinging jellyfish that are too small to see by eye. They will use this technology to look for Gonionemus vertens polyps, which may be attached to aquatic plants or bulkheads in the Shrewsbury River estuary. This year, seven sites within the Shrewsbury River estuary where the species was found are being sampled, as well as other locations in the Manasquan River and Northern Barnegat Bay. Both the adult (medusa) and polyp stages of the clinging jellyfish are capable of stinging, a mechanism they use to stun prey and to defend against predators. The DEP is encouraging the public to “exercise common sense and caution” during recreation in areas where the jellyfish have been discovered. Anyone wading through these areas, especially near aquatic vegetation should take precautions, such as wearing waders to protect themselves. Swimming near lifeguarded beaches is, as always, encouraged.